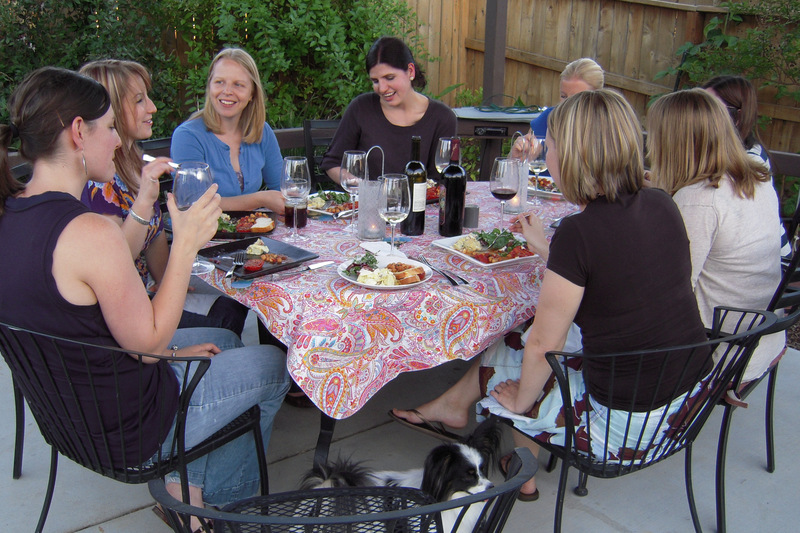 I hosted this month’s book club at my house, and we had two new women joining us, so I was excited and determined to make sure everyone had a good time. Our book selection was Orangette author Molly Wizenberg’s “A Homemade Life,” and the plan was to make recipes from the book and/or blog. We had an appetizer of an assortment of cheeses, breads, crackers, and fruits. 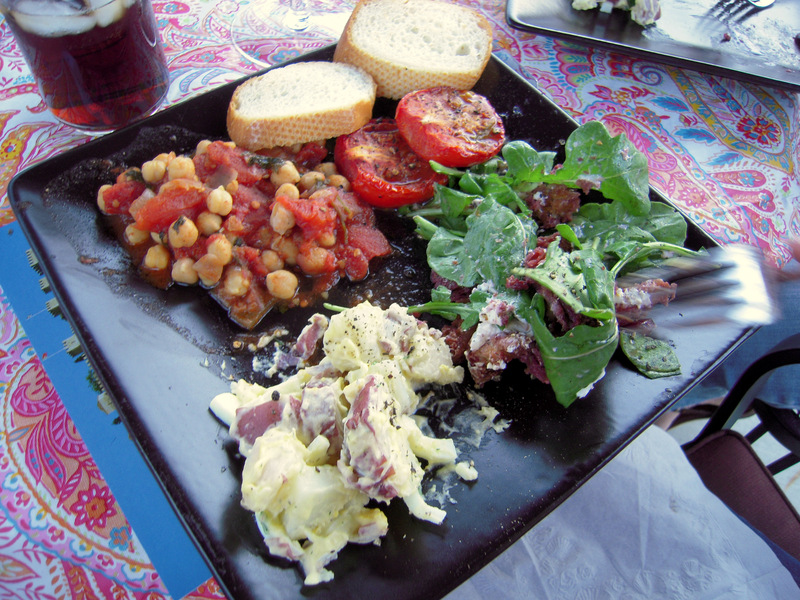 For dinner, Laura made the Chana Masala, Nicea made the roasted tomatoes, and I made Burg’s potato salad. It was a challenge for me to step outside my tried and true potato salad recipe and make one with ranch dressing, dill, and caraway seeds, but I think it came out well, and there wasn’t any leftover–a good sign. The unanimous hit was the bread salad with cherries, arugula, and goat cheese. Beth used fresh cherries from the farmer’s market to add sweetness to the salad, and the toasted bread mopped up the juices from the cherries, balsamic vinegar, and olive oil with perfection. Oh, and Beth showed me how to use the “food” setting on my camera, and we practiced getting more delicious food shots with about 15 different pictures of the dessert (winning entry here). 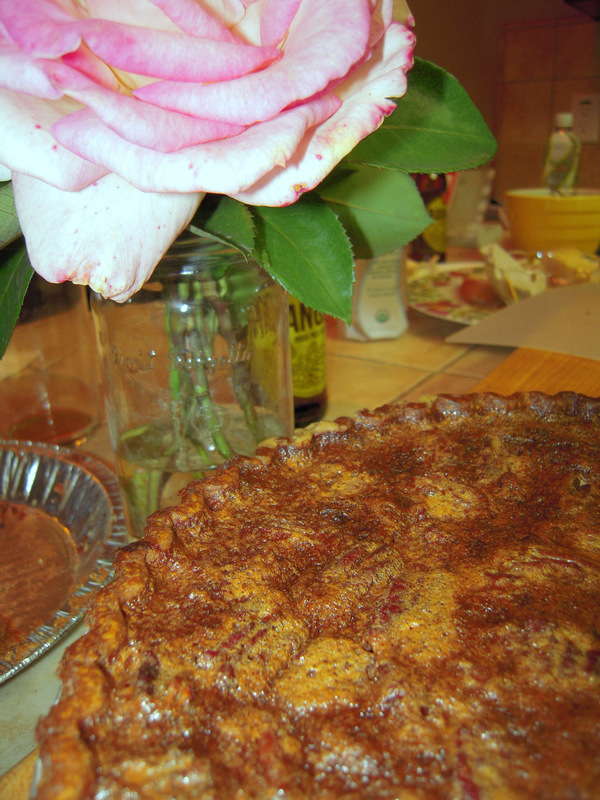 Rachel made Hoosier pie: a pecan pie with bourbon and chocolate chips. It was rich and delicious, and I had to force myself to stop eating it. It was 1 a.m. before we knew it. I wasn’t sure if everyone stayed later than usual because of all the wine we drank and their need to sober up, or perhaps that they were having such a good time they didn’t want the evening to end. Hopefully it was a little bit of both. I had no idea it was 1 AM, I was just enjoying myself! !